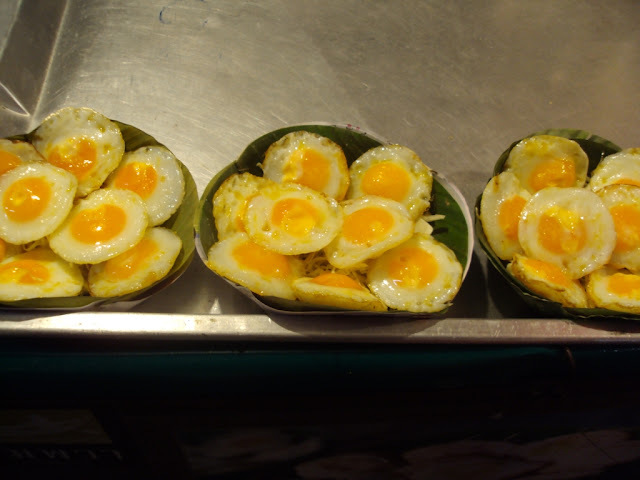 You may have noticed that I didn't download any recipes for a while, that is because I was in Bangkok! Bangkok was quite interesting! I have never been east from Jordan (except to Qatar and Australia), and Thailand was certainly different than any other culture I have been exposed to. One thing I found is that food is a big part of Thai culture. 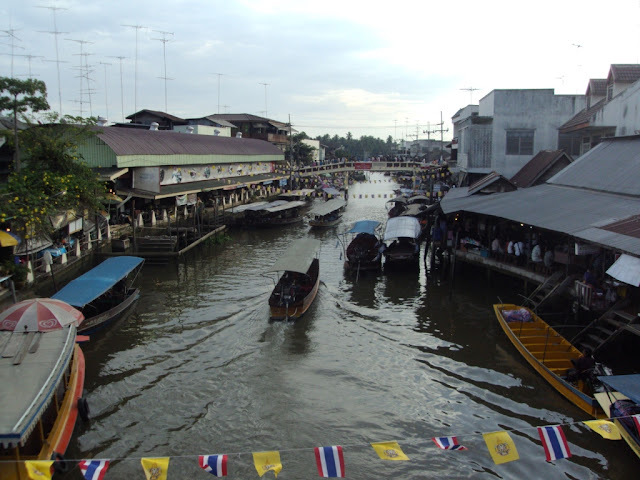 During my trip, I went to the floating market which is equivalent to the local market available in many countries. The floating market is different in that it is on a river with kiosks on both sides of the river and hundreds of small boats. 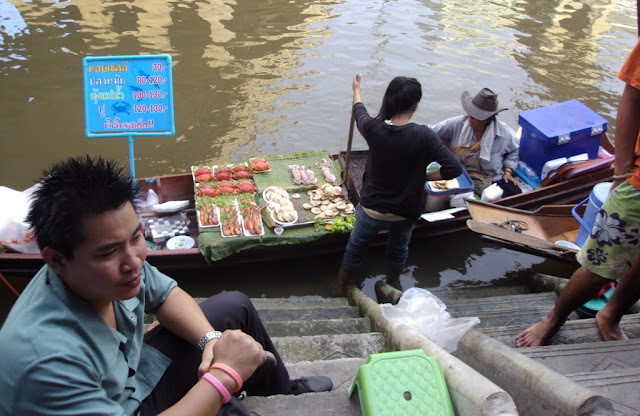 Traditionally, the boats sold fruits, vegetables, meats, sweats spices .... The floating market I went to only sold cooked Thai food from the boats. Similarly, the kiosks sold mainly food with a few here and there selling handmade jewelry or t-shirts with "Thailand" written on them! This is my meal being prepared! I enjoyed the fish much more than the prawns. 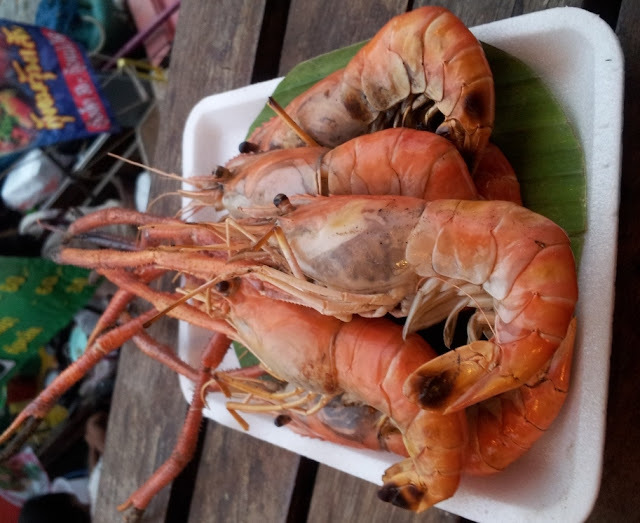 Prawns were not my type of dish given the way they were presented!! 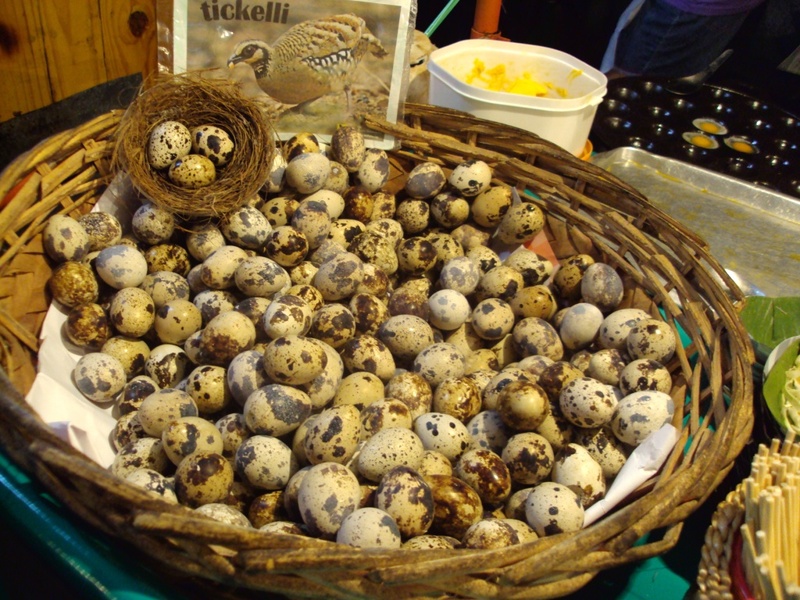 But I tried them anyway, and they tasted good once I found my way to the meat. Don't ask me what the last dish is, as I don't know. I tried asking the lady selling it but couldn't understand the answer. All the dishes I tried, whether at the floating market or the various restaurants I went to, were tasty! Hot yet good! I learned the hard way that Thai food, similar to Indian food, is spicy hot! I usually ordered my dishes mild to medium hot, and ended up with a dish that was towards my upper spiciness limit. Upon taking the first sip of my medium-hot Tom Yum soup, I felt a gripping heat running through my whole respiratory system! I tried to speak and my voice was not coming out beyond a mild whisper. My ears were drumming, and my lips, tongue and throat where throbbing! Other than that, the soup was good and I did take a few more sips before I decided to mix it with my steamed rice which worked superbly. As many of you asked me, before I went, to bring back a Thai recipe, I spent a few days exploring how I will do that. Then my dear husband suggested I ask the hotel staff if it is possible for their chef to teach me a traditional Thai dish. I was a little hesitant at first, but then thought, what the heck there is no harm in trying! I contacted the hotel staff and received a positive reply! 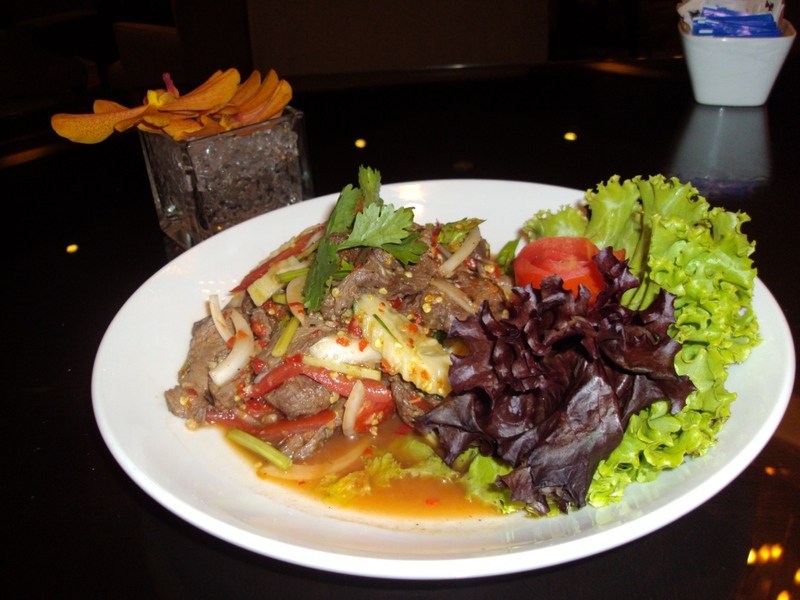 Hence, the Spicy Thai Grilled Beef Salad recipe is the compliments of JW Marriott Bangkok. 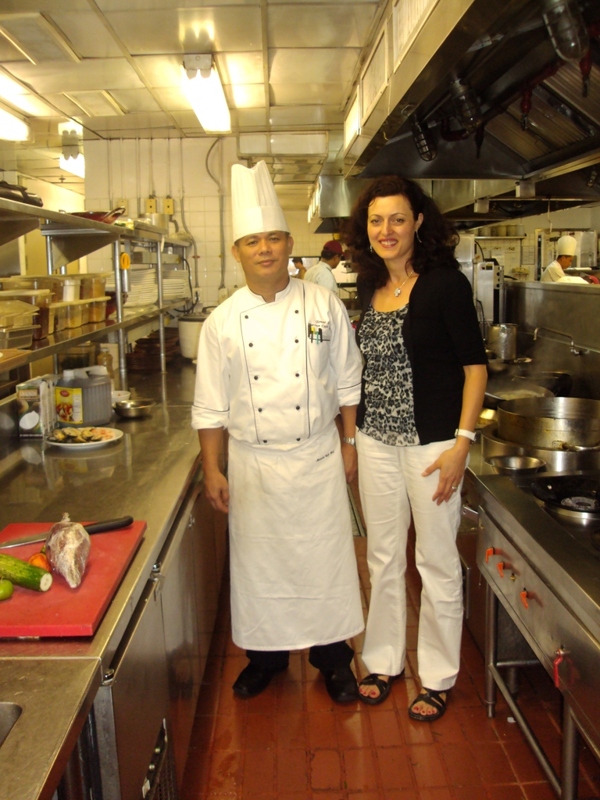 Chef Tanai Jitmanowan was very gracious with his time and explanations. 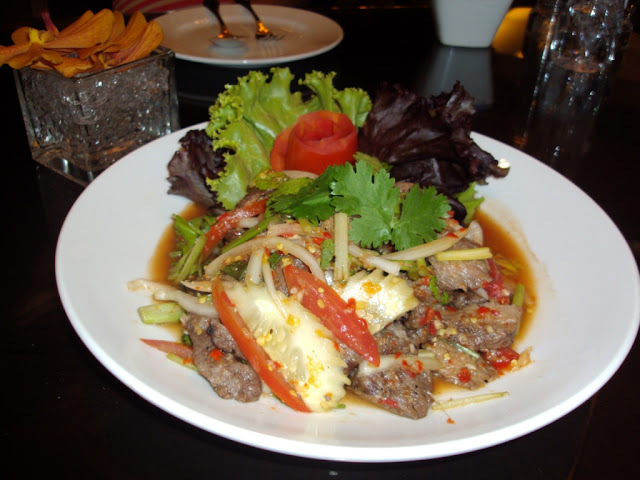 Chef Tanai explained that the Yam Nua Yang dish (Spicy Thai Grilled Beef Salad) is one of the most popular appetizer dishes in Thailand and comes from the middle region. 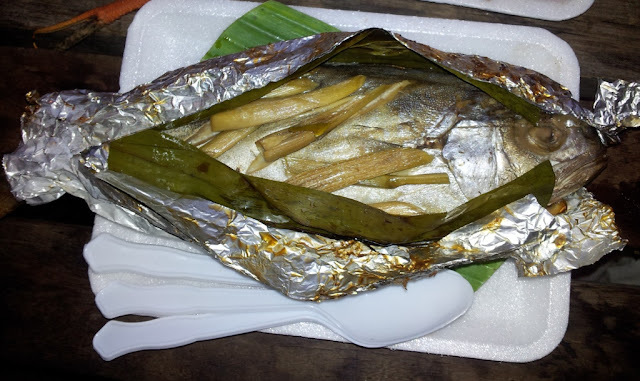 The original Yam Nua Yang version would use less or no vegetables and may include dry rice. Additionally, he advised that the beef may be replaced with chicken fillets, fish fillets or shrimps. The Yam Nua Yang dish (Spicy Thai Grilled Beef Salad) as per this recipe is quite hot, mild hot if you compare it to the Tom Yum soup I had, but nonetheless, hot!! 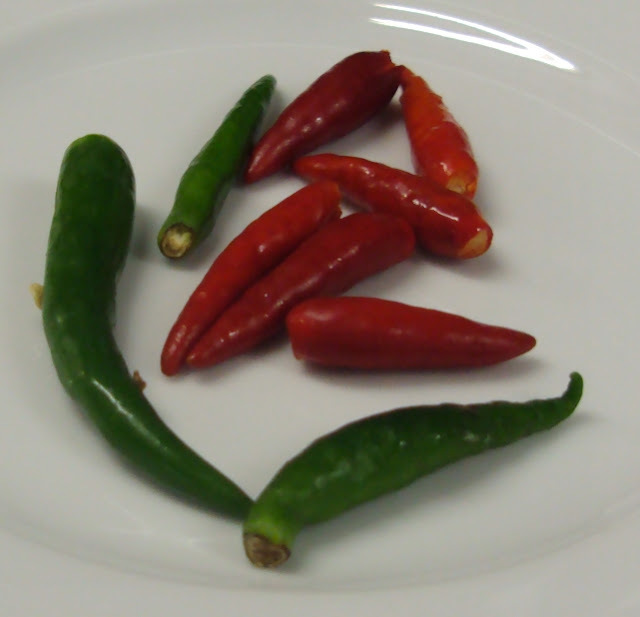 So if you are not a big fan of spicy food, cut the chili to half. I also added cucumbers to the original recipe the chef gave me as I thought that gives it an added kick. 1. Wash the steak, remove the fat and season it with salt and black pepper. 2. Grill the steak over charcoal grill or in non-stick pan until medium done. 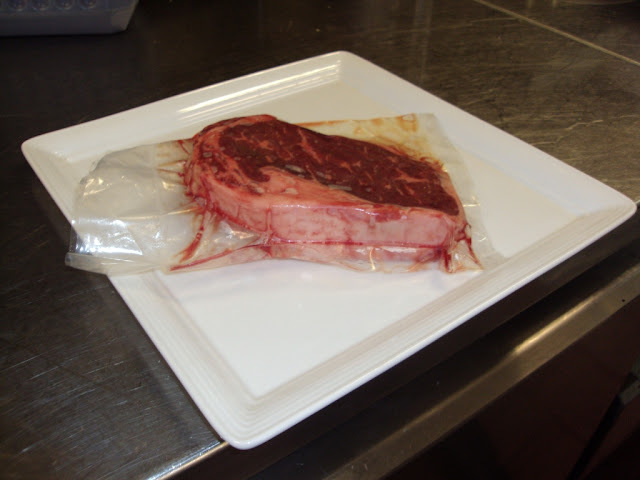 After that, slice the beef into thin slices, and set aside to cool. 3. Once the beef is warm, mix in the tomato, cucumber, onion, celery stalk and spring onions. 4. Mix the lime juice, fish sauce, sugar, garlic and chili well. Add to the steak mixture and toss well. 5. Arrange the green lettuce on the serving plate. Pour the beef salad on top. 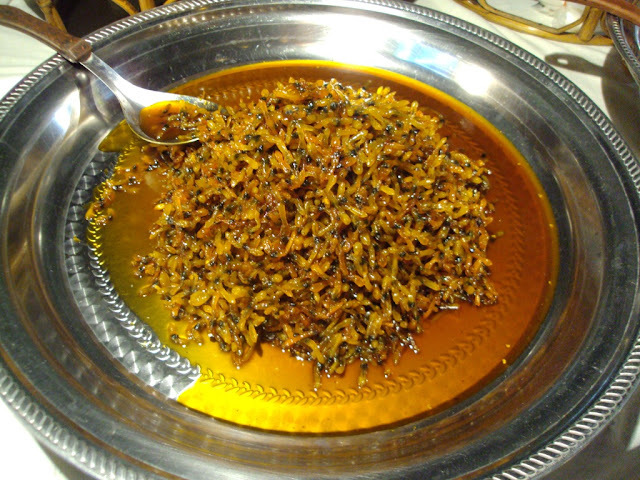 According to chef Tanai, if you don't have fish sauce at hand you can substitute it with a vinegar, salt and water mixture but the best result is with the traditional fish sauce. Hope you enjoyed today's easy recipe: Yam Nua Yang (Spicy Thai Grilled Beef Salad). Bon appetite from me and JW Marriott Bangkok. Hi Seta, great blog! WOW, Thailand! PS: I'll be in touch with tips on Italian dishes. OK, you've been back three days and no word from you but your blog is updated--priorities, priorities. Great pictures.